Over the last little while I have been trying some new things with my camera. What’s the point of having the thing if I’m not going to try to use some of its cool features. Also, I want to get back to taking pictures like I did with my first real, and trusty, camera — a 1970’s Pentax K1000. That’s right, my first camera is that old, and I really did STOP using the AUTO setting. After years of point-and-shoot cameras and phones with increasingly improved cameras, I am taking more time with, and getting more enjoyment from, my DSLR. Actually I pretty much moved away from that basic AUTO setting when I bought the current camera, but every once in a while I fall back too or some of the other presets so I have been making a concerted effort to take different types of photos. Here are two photos I recently took as I try to expand my skills. I still have a lot to learn, but it was fun researching how to take the pictures (sometimes afterwards) and seeing what I managed to take. 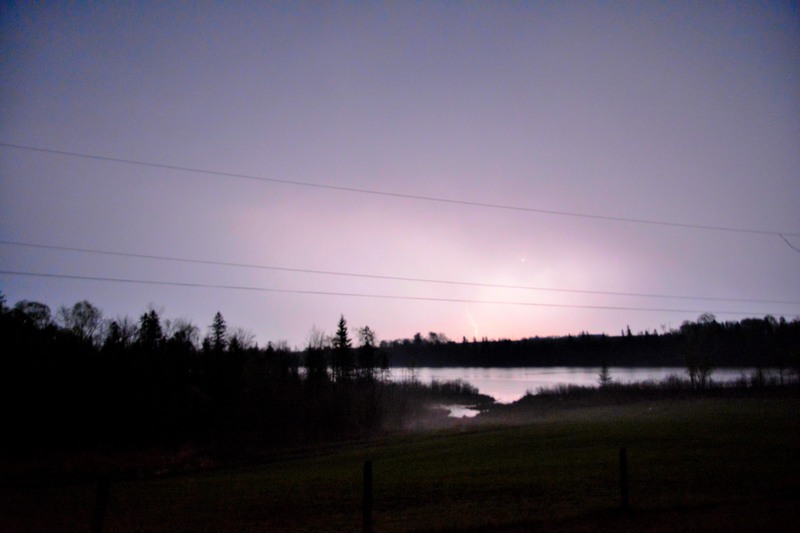 The lightning strike image was taken fairly quickly as the storm rolled through the Ottawa Valley. 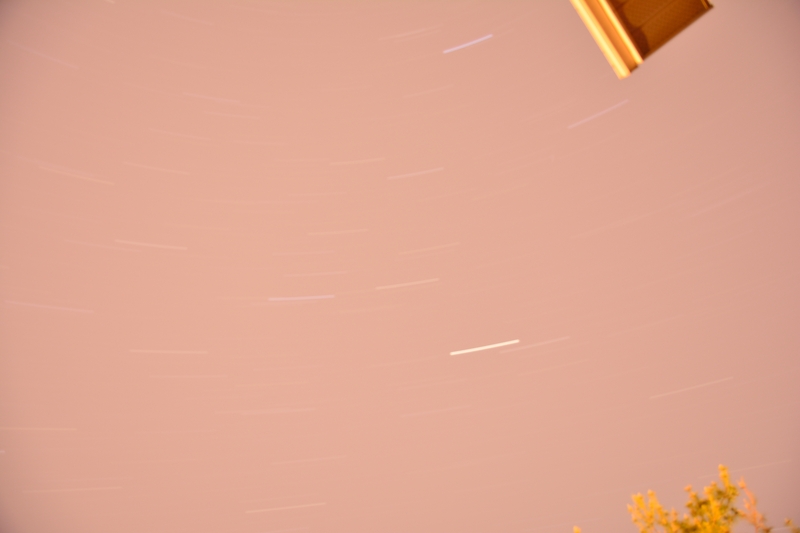 I didn’t really set up the camera properly, which is why the image is a bit blurry. Also, I didn’t have a god sense of all the settings needed for a good shot. 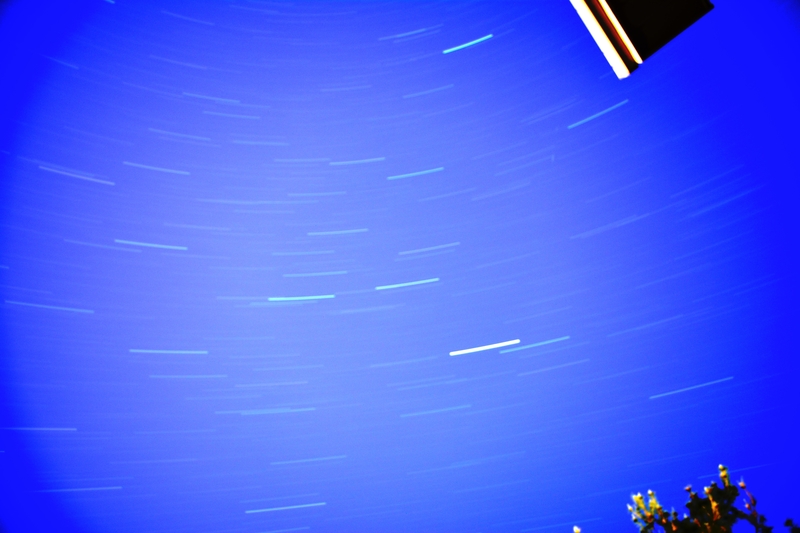 The star trail shot was taken with a 90 minute exposure in my backyard. I had done some reading about how to take this kind of shot, but it was really just a shot in the dark in terms of what I would get. There is a fair bit of ambient light from neighbours’ windows, a street light, and the moon so I’m amazed I managed to get anything at all. After I played with the Nikon photo editing software, which is relatively basic stuff but good for me to start with, I ended up with these images. I still have lots to learn about the photographic techniques required for these shots, as well as the post processing tricks, but I’m actually pretty happy with the results. As always, tips and suggestions are welcome. You are light years ahead of me in terms of camera knowledge and experience. I still have my training wheels on so these photos are simply amazing to me. Thanks Joanne. 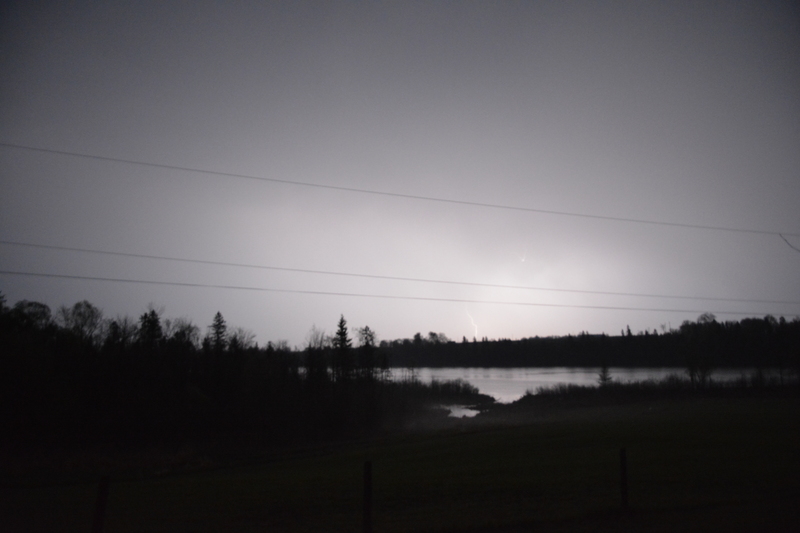 I think I mostly got lucky with both shots, but that’s the beauty of digital photography. I’ve spent a bit of time reading on different techniques, and practicing so that I can get better. Like most things, I need to do it more to get better. BTW, don’t sell yourself short. You’ve posted some great shots yourself. Clearly you have a good understanding of your camera, composition, and what you like. ahhh – thank you. That’s a really encouraging comment and I appreciate it a lot.